These fixed log panels are made from quality FSC timber. These landscape edging are pressure treated for long life and guaranteed for 10 years against rot. This log edging is cut from 70mm timbers. 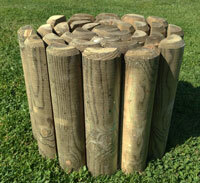 These log garden edging can be painted or stained to match any décor. Size: 1 metre (Length) x 0.15 metre (High). * 0.15m high is the height of the panel when hammered into the ground. Size: 1 metre (Length) x 0.23 metre (High). 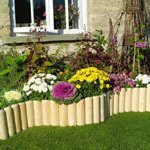 Prices for garden edging in wood start from only £5.99.